A growing business’s worst nightmare can be losing focus and straying from its course. We wanted to know: What growing pains do business owners face once they have opened their doors? What are their struggles and successes? Check back in next week—we’ll be telling the unique story of another small business. You can find our previous installments here and here. NorthWest Burgers began by taking over a defunct burger joint’s space and equipment in the “International Cafés” area at the Fifth Street Public Market in Eugene, Oregon. Since then, the Kirsches’ endeavor has paid off with a devoted local following and “best burger” accolades in local media, and they have been able to hire six employees. Through it all, the Kirsches have stuck close to their focus: making fresh food from scratch with high-quality ingredients. Kirsch distilled his simple vision from his education and over 15 years experience in the restaurant industry. He got his start at 16, working in pizza restaurants and later a Subway. From there he moved up to more upscale restaurants, and into management, with duties including operations as well as grand openings for restaurants throughout the Eugene/Springfield area. In 2007, Kirsch completed his associate degree from the culinary and hospitality management program at Lane Community College (LCC) in Eugene. His future wife was a fellow student in the culinary program, and he credits LCC with teaching them the basics on how to operate small to large businesses. Kirsch’s combination of education and experience honed his vision for what his business would become. He developed perspective on the challenges of getting attention and building regular customers in the food world, and also learned the nuts and bolts of managing the operations, personnel, equipment, supplies, and finances of a restaurant. After working at another Fifth Street Public Market eatery during early 2014, Kirsch understood the possibilities in the International Cafés space. He and Felicia knew they wanted to start their own business, so they began keeping their eyes out for available spaces in the popular, competitive café area. Above all, Kirsch began to realize where he and his wife could create a business that truly stood out. While demanding and time-intensive, that focus on working with ingredients—instead of, say, pre-made burger patties—has also given the Kirsches the ability to create burger combinations that have attracted devoted fans and regular customers. Nothing typifies this more than NorthWest Burger’s signature Bork, a combination of ground beef and ground pork that’s mixed with bacon and blue cheese from Oregon’s historic Rogue Creamery. Topped with a chipotle aioli and served on a bun made from local bakery Reality Kitchen, the Bork has become a local legend. Making their own sauces has further enhanced their reputation, and making their own allows them to constantly refine, tinker, and improve—such as a current project to research the origins and experiment with different sugars and soy sauces for their house teriyaki (they’re also refining the beer batter for their onion rings). The beef, however, is what really separates NorthWest Burgers. Starting a restaurant is intense—not the least because of all the equipment investment, remodeling, and decision-making. Unless you do an end-run around that, and simply take over the space of a similar eatery that went out of business. When a burger place in Fifth Street Public market closed in 2015, Kirsch immediately got in touch with the Market’s leasing office to open NorthWest Burgers. Building on that strategy and relationship, when another eatery left the Market later that same year, Kirsch jumped on that opportunity as well. A month later, he and Felicia used that second space to launch another restaurant, Made From Scratch. Looking back, Kirsch realized that instead of keeping things simple, they had made a complicated mistake. 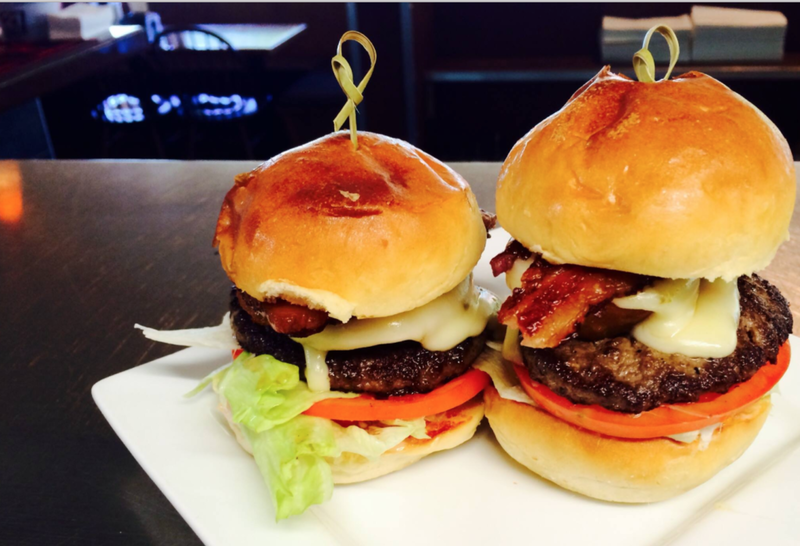 After six months, the Kirsches closed Made From Scratch to focus solely on NorthWest Burgers. It was a painful decision, but a good one that returned them to their plan to keep things simple. Instead of pursuing commercial loans—an area where he has seen others struggle with terms and payback—the Kirsches focused on a combination of bootstrapping, self-financing, and securing personal loans from family and friends. The flexibility gained gave the Kirsches breathing room for the first few months of operation, and has helped them keep the finances healthy. Innovation is never easy. Burgers remain one of the most popular foods in the U.S., and from fast food to upscale gastropubs, there is no shortage of places that are happy to sling meat between two pieces of bread. Kirsch acknowledges that one of their biggest ongoing challenges is standing out from other popular and more established local burger spots. NorthWest Burgers leverages word-of-mouth, Facebook, and Instagram to stay front-of-mind with customers. “Getting people in the door is always the hardest,” says Kirsch, especially in winter. The cold, wet winter of 2016 was especially difficult. “Ice and snow always kill business for Oregonians,” he says. However, the solid location has proved to be an asset. Fifth Street Public Market is a popular local retail space; this visibility, coupled with NorthWest Burger’s easy-to-understand vision of handmade quality, continues to help them grow. The model also has other pros and cons. “This is an owner/operator business, which you don’t see a lot of in the burger world,” says Kirsch. Being on site every day keeps him in touch with customers, but it also adds demands on his time, which he and Felicia continue to figure out how to navigate. An intensive focus on making things from scratch is only partially about the ingredients. It’s also about the people. Finding a great team has been key in helping the Kirsches work through their growing pains and keep the business moving forward. Over the next three years, the Kirsches plan to expand NorthWest Burgers into a bigger establishment, with dedicated space for parties and other events, where they can serve more people. They also plan to expand the menu, but just slightly, so as to stay true to their original plan and focus. The people you hire make a big impact in your business. Look to those you’ve worked with in the past for hiring and referrals, but when the time is right, don’t be afraid to expand your search beyond your immediate network. Have daily sit-downs with your partner or management to discuss how the day went and where you can improve. Keep up with what’s happening in your area and with what’s trending, but stay true to yourself and represent your business as you want your customers to perceive it. Treat employees like family. Keep them engaged, empowered, and motivated. Offer raises, bonuses, and other perks and incentives. The Kirsches sit down with each employee every three months to discuss performance and where they can improve.